Vijay Sethupathi And Trisha thanked everyone for showering love on their film. 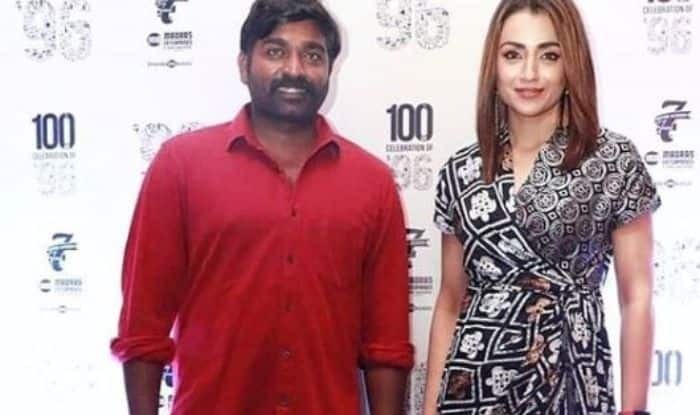 96 featuring actors Vijay Sethupathi and Trisha turned out to be one of the biggest blockbusters of 2018. The movie revolves around a school reunion that took place after 22 years. It received positive response from the cinema lovers and continued to run in theatres despite its television premiere. Govind Vasantha’s music also played a major role in making it a big hit. The entire team of 96 turned up for the grand 100-day celebration event. It was a delightful treat for the fans to see these two stars together. One of the highlights of the night was when Parthiepan called up Tisha and Vijay on the stage. He requested them to hug each other. This made the audience happy as people couldn’t stop cheering for both of them. The actor took the mic and called the occurrence as the actual climax of the film. Both the stars thanked everyone for showering love on the film. Trisha stated that she wants to be part of such fantastic films in future. The lady also thanked Vijay for playing Ram in the movie. She credited the success of 96 to the entire film. He stated that iconic scenes from the film will be recreated for the remake.